Allison Marsh has been exploring industrial sites since her 2nd grade class field trip to the Philip Morris cigarette plant. She has degrees in engineering and in history from Swarthmore College and a PhD in the history of technology from Johns Hopkins. She is currently an assistant professor at the University of South Carolina where she teaches public history. With the smell of mining dust still in my hair (even after washing it twice!) I decided to spend the afternoon in a more relaxing atmosphere – at the Parque Cretacico (Cal Orck’o) or Dinosaur Park. We know this thanks to the fine workers at the Francesa cement quarry who in 1994 uncovered a vertical wall bearing the tracks of numerous dinosaur groups. I’m no paleontologist, but even I could make out the tracks criss-crossing the face of the wall and imagine scenarios with the dinosaurs duking it out.Sucre may be a pleasant tourist destination today, but 65 million years ago it was the stomping ground of at least 150 distinct dinosaur species. To their credit, Francesa has preserved the dinosaur tracks and cordoned them off for curious tourists. According to my friends, you used to be able to walk right up to the tracks and watch them crumble in your hands, but a more defined tourist infrastructure has put an end to that. The Parque Cretacico now provides an audiovisual introduction to the site (an animated movie), a winding path through life-sized replicas of the giant lizards that occasionally roar, and a viewing platform approximately 100 yards from the wall of dino-tracks. There are coin-operated telescopes to give you a close-up of the prints. Sure it would be more fun to run through the dinosaurs’ playground, but the Parque Cretacico still provided a lovely was to spend the afternoon. And if you got bored with the dinosaurs, you could always look out in the opposite direction and observe the operations of the cement factory. It’s not everyday that you purchase a stick of dynamite and a bag of coca leaves (at least not for me), but today I was touring the mines of Potosi, Bolivia, and the purchases were a suggested gift. Because the mine gives to us, we should give to the miners, as goes the tourist tradition. It is customary to bring useful gifts to the miners: dynamite, clearly to blow up the rock (miners have to supply their own); soda for dehydration; and coca leaves to chew to combat the high altitude and dust. 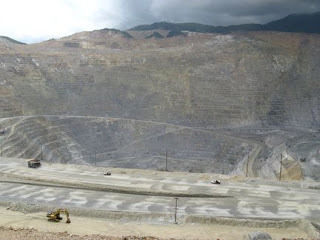 At an elevation of over 13,400 feet(4,070 m), the cooperative mines of Potosi are one of the highest in the world. Cerra Rico, the “rich hill” of silver, has been mined for over 470 years. The mountain is riddled with more than 180 separate mines, leading to ongoing calls for safety and warnings that the mountain will collapse in on itself at any moment. But as long as there are extractable minerals, workers will risk cave-ins, deadly gases, and silicosis to earn a living. On any given day, approximately 5,000 miners are working the mountain. In recent years, tours of the mines have become a popular side business. Over a dozen tour operators have sprung up to guide the inquisitive traveler and adventurous tourist through the working mines. Make note: this is not museum tour; this is not a safe demonstration space; this is a first hand experience of an extremely dangerous occupation. In a side conversation one of the tour guides admitted that five miners died last week. A typical tour begins with a stop at the miners market, where you can purchase your expected gifts. You then continue to an ingenio, or first stage smelter, where the minerals are extracted from the composite ore through a flotation process. Although it was silver that made Potosi a thriving Colonial town, it now only accounts for 1-3% of the extracted metal. Cerra Rica now produces more zinc (6-7%) and lead (4-5%). Overall, the extracted rock is about 85% waste material. The guide explains that the floatation process uses copper sulfide and cyanide to separate the metals from the ground rock. The guide does not mention the environmental cost of using such chemicals, but the observant tourist can deduce that there isn’t much of a reclamation process going on to keep the chemicals from leeching into the soil. After the ingenio, the guide leads you through a typical mine for about an hour. No safety railings, no emergency lighting, and nothing but a handkerchief to keep from breathing the silica dust. We lost a quarter of our group when we descended a claustrophobia-inducing steep shaft to the second level that you had to negotiate on your belly. Those folks returned to the surface to breath fresh air. 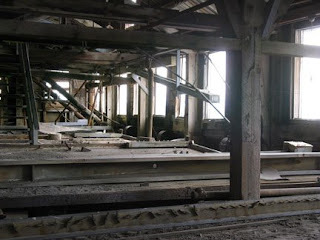 The deeper we descended into the mine, the hotter it got and the thicker the dust in the air. As we stopped to observe a miner hammering a dynamite hole, I was wheezing so hard I couldn’t catch my breath. As it happened, I toured the mine on a Saturday when there was a big football (soccer) match, and most of the miners had taken the day off. This actually minimized the dust, noise, and danger, but also limited my exposure to seeing the work in progress. Even so, I quickly had enough and was happy when we turned around and headed out. My friend and colleague (a Bolivian historian) had taken the Spanish language tour while I had gone on the English one, and when we were reunited on the surface, we compared notes. It was clear that Gabi had gotten much more factual information from the assistant guide on her tour than I had from the guide on mine. Was it simply a language barrier or was something else going on? My tour was clearly crafted for the “experience” of touring a mine, and for that it was quite successful. I will never forget the smell, the heat, and the difficulty breathing. The cursory explanation of the mining process was correct, but lacked any contextual explanation to place it in historical or technological context. It was a missed opportunity to open up questions about labor practices, economic drivers, and social structure. I was left wanting more. But where there is want, there is motivation. Perhaps the next time I pass through Potosi, I will bring something more than dynamite and coca leaves to the miners. Gabi and I are now working on a grant to provide a solar-powered shower for the miners to bring some dignity to one of the world’s worst jobs. For people who want to do more research on the mines, check out the Servicio Nacional de Catastro Minero (SENCAM) at the archives in Sucre. They will have cataloged the notary collection related to Potosi mine claims (1880-1997) by the end of the year. An interesting preliminary result is documentation on women mine owners. By halfway through the tour, she was exasperated. Unable to answer our questions, she began questioning us. What was our background? Why did we want to know this stuff? Simple curiosity didn’t seem to be an acceptable answer. I had to remind my dad of the time he almost got thrown off the coffee plantation tour in Hawaii because they thought he was an industrial spy. 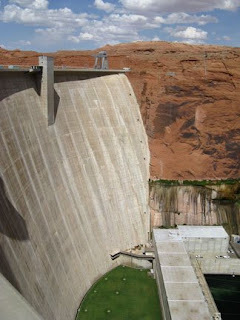 Glenn Canyon Dam is protected by Homeland Security, and I really didn’t want to get into too much trouble. So we just closed our mouths for the remainder of the tour. On the elevator ride back to the top of the dam, our guide admitted to us that she usually goes all day without having a question she hasn’t already answered a hundred times before. All of our questions were new. When she returned to the comfort zone of the front desk, she immediately turned me over to the NPS ranger for answers. The ranger tried to refer me to the movie in the auditorium, but I had too many comparable statistics from Hoover Dam to be placated by a general video. The ranger retreated to the back room and sent out a superior. I urge the NPS and the tour guides at Glenn Canyon to think about our questions and their mission to educate their visitors. For most people, the standard tour is enough. But for the occasional visitor who wants to know more, have knowledgeable guides on staff who can engage in a detailed discussion. As with most of the tours I go on, I’m always trying to answer the question, “Why do people want to see this?” In the case of the Glenn Canyon Dam, clearly tourists don’t want to learn about electricity generation. 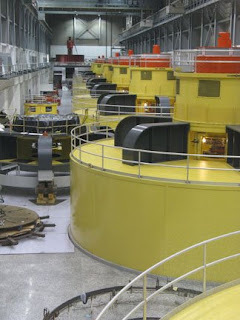 If they do learn the fundamentals of hydro-electric power, I think that’s great. But a quick check in at the coal powered power plant only two miles from the dam confirmed my suspicions. There were no regularly scheduled tours, no gift shop, no interest from the public. Just as I was bemoaning the fact that geologists never discover ore in convenient locations, I come across the Kennecott Copper Mine located just off Interstate 80 in suburban Salt Lake City. Just as Kennecott was closing down its interests in Alaska, they bought up the Bingham Canyon mine. 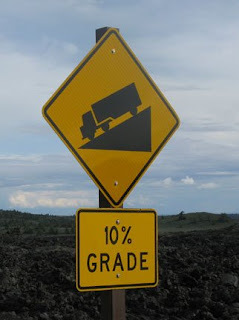 It was a very different grade of ore and required a very different type of mine. They pretty much invented open pit mining. This is one big hole. As a museum professional, I hated the visitor center. I could list all of the faults I saw with it, but I was clearly in the minority opinion. Walking through the center, I heard Spanish, French, German, and English being spoken. The audience was incredibly diverse, especially for Utah. Intergenerational groups were talking with each other about copper. All around me a heard exclamations of, “Wow, I didn’t know that!” A quick look over their guest book showed geologists from Germany, visitors from South Korea, and folks from over a dozen different states – and that was only for today. Despite my reservations, it was clearly a success. 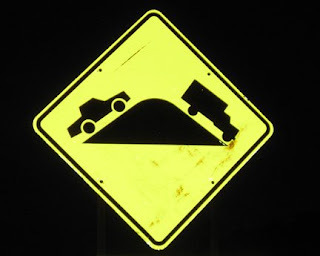 Trucks probably shouldn't be on this road if the cars are having problems. 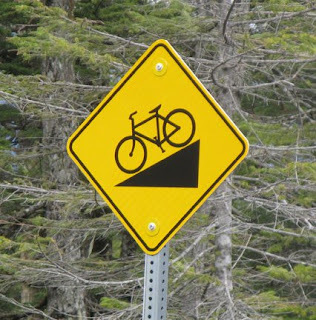 Not even safe for bikes? So Much More than Potatoes! This is my first trip to Idaho, and I am loving it! Not only is it a beautiful state with friendly people, but it also has a number of surprise attractions for the Technical Tourist. Tired of driving, we pulled into the tiny town of Challis. Showing no signs of sustainable economic activity (not enough agriculture, clearly not a tourist destination, no factory infrastructure), we were puzzled as to why there were a dozen motels lining the main road. Of course, when there is no outward sign of industry, look underground. The bartender at our motel confirmed our suspicions – mining! 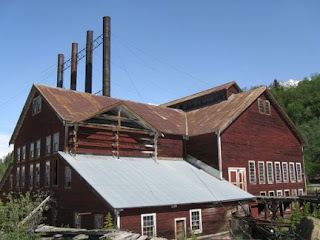 But not just any old mine, this is the only molybdenum mine in North America. Who doesn’t love moly? Thomas Creek does offer tours of the mine. 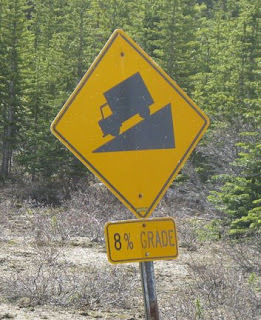 Our bartender (who also drives the fuel truck up there sometimes) gave us the phone number of the guard station, but everyone in town suggested we just drive up to the mine. Unfortunately, when we arrived all of the managers were in a meeting and no one could give the authorization to get us in. Better luck next time. Continuing our drive south, by noon I was getting peckish, and forced my dad to pull over in the town of Arco. Another grand surprise. 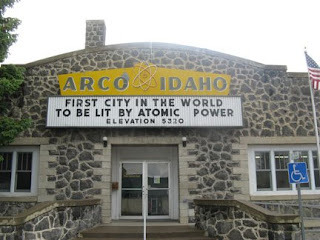 As the sign outside city hall proudly proclaims, Arco was the first city to be lit by atomic energy. We went inside to find out more information and discovered the front desk staff leafing through the archives of the local newspaper, the Arco Advertiser. Arco is celebrating its centennial this year, and they are busy putting together a cd of the town’s history. 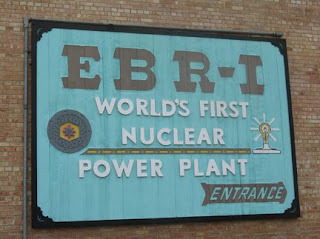 The exceptionally friendly staff told us all about EBR-1, the experimental breeder reactor down the road a few miles, and encouraged us to take a tour. They also urged us to return to Arco in a few weeks to celebrate Atomic Days, their annual town celebration. I’m tempted. How can the technical tourist refuse an invitation to see the first experimental breeder reactor? Of course I knew the basic history of the Manhattan Project and the reactor at the University of Chicago, but I had no idea that Idaho played such a big part in researching the use of atomic energy. Idaho National Labs is clearly still doing some interesting research, but the Department of Energy clearly wishes to confine tourists to its historic work. My final Idaho surprise came after a disappointing trip to the Hagermen Fossil Pits (Don’t get your hopes up. There are no fossils to see.) On a whim, we turned off the road to see the National Fish Hatchery. I was surprised to discover we weren’t the only tourists viewing the fish hatchery on a random Tuesday afternoon. I was even more surprised to learn that their visitation rate would make most museums jealous. And I was even more surprised to find out that 75% of the stocked trout in the US is grown in the high plains of Idaho. It takes about 11 months to grow a fish. They had just shipped out all of their stock, and they ship all over the country. Now, every time I see a truck on the highway, I wonder if it is full of fish. The luxury of traveling in your own vehicle is that at any point along the way you can on a whim decide to turn right and drive 94 miles down a pothole-filled, gravel road hoping that there’s something worthwhile at the end. Admittedly, it often ends with a headache, sore back, screaming at your traveling companion, and being rejected by the hotel when you show up at 11:00 pm due to the size of your dog. 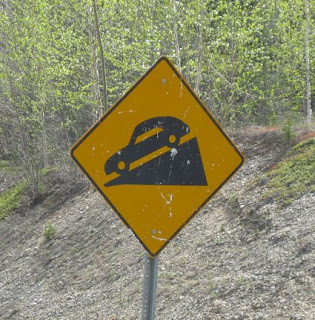 (We had even double checked on this when we made the reservation before heading down that bumpy road. Argh.) But sometimes the trip is actually worth it. Thus we toured the remains of the Kennecott Mine. It’s a fascinating industrial site situated in the middle of a picturesque, rugged landscape, but makes me wonder why geologists can’t ever seem to find ore in more easily accessible places. 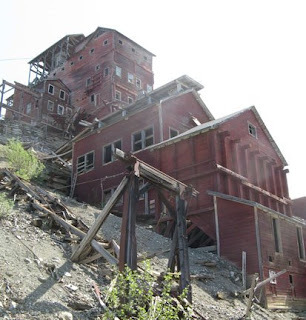 Some of the buildings in Kennecott are privately owned, some are in varying stages of collapse, and some are being restored, or at least stabilized, by the National Park Service. The most impressive building in the group is the mill house, which cascades 14 stories down the side of the mountain. Perhaps one of the more structurally unsound buildings I’ve explored lately, but I’m thankful that the Park Service let us in at all.